This course is for people that frequent the outdoors, camp counselors, hikers, family trips to experience the outdoors and want to learn to be better prepared when EMS can be delayed. Minimum age to attend this course is 16 y.o. Have a wilderness experience, meet new people that also love the outdoors and learn new skills. Wilderness environments create special situations not usually encountered in an urban or suburban environment. With an ASHI Wilderness First Aid class, first aid providers in a remote outdoor setting will be better prepared to respond when faced with limited resources, longer times to care for someone, and decisions about when and how fast to evacuate an ill or injured person. This comprehensive 16-hour wilderness first aid course meets or exceeds the Boy Scouts of America Wilderness First Aid Curriculum and Doctrine Guidelines. 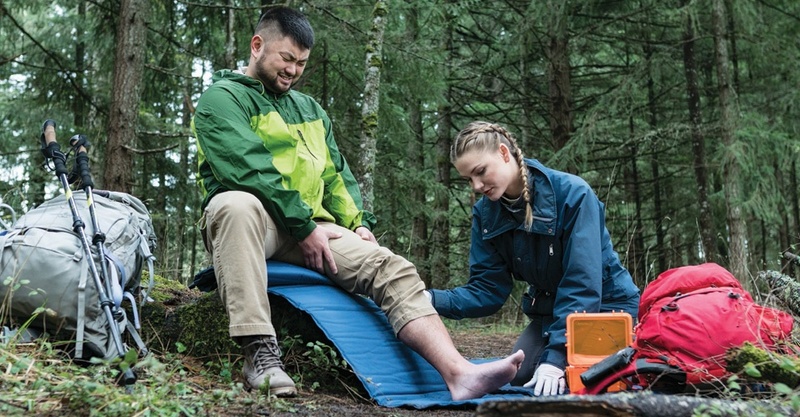 Information covering wilderness and remote first aid from a basic understanding of emergency response in an outdoor setting to specific techniques and considerations for a wide range of injuries and illnesses. Individuals who are not healthcare providers or professional rescuers but desire or are required to be certified in wilderness first aid knowledge and skills. Prior completion of a basic first aid class is strongly encouraged. THIS COURSE WILL BE INDOORS AND OUTDOORS AND WILL BE HELD RAIN OR SHINE. THIS COURSE WILL BE CANCELLED IF LESS THAN THE MINIMUM STUDENTS PARTICIPANTS HAVE NOT BEEN MET.